Vocal debuts by noted instrumentalists are almost always a dubious prospect. Moby had to become a jingle house to be taken seriously outside of techno circles, and five years later the jury’s still out on Johnny Marr’s turn as frontman. New York-based composer, violinist, jazz session mainstay and band leader Jenny Scheinman certainly boasts a lower profile than either of those two, but regardless has made her bid for dual threat status with not one but two albums, each showing a different side of a musician already known in jazz and classical circles as one of the best. Stylistically, the two can almost be viewed as dual love letters; her self-titled, roots/blues/folk vocal debut harkening back to her childhood home near Cape Mendocino, CA, and Crossing the Field playing as a whimsical, jazz-informed score for her adoptive hometown of New York City. Jenny Scheinman finds its namesake mixing originals with covers by the likes of Lucinda Williams and Bob Dylan, alternating between uplifting road house boogie and somber meditations on love and loss. On her own “Come on Down,” Scheinman beckons to a would-be-lover over a superb blues groove reminiscent of Double Trouble at its finest; on “Shame, Shame, Shame” (originally by Jimmy Reed), she channels the soul of wronged women past into old-time folk stomp. “The Green,” another original, tells the tale of a young girl’s disappearance, while her aching turn on the sparse, melancholy “Rebecca’s Song” finds Scheinman channeling her inner Aimee Mann. Dubbed her “instrumental extravaganza,” Crossing the Field mines Scheinman’s vast compositional repertoire, unearthing gem after gem of classically-informed jazz (or, with the cover of Duke Ellington’s “Awful Sad,” jazz-informed classical). Scheinman trades leads with guitarist Bill Frisell and pianist Jason Moran throughout, and the alternating shifts in instrument create an air of a musical showdown between friends. 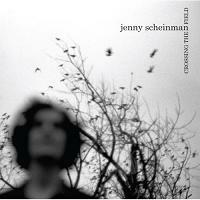 Theoretically, the relatively minimalist folk arrangements of Jenny Scheinman and the orchestral leanings of Crossing the Field should create an almost irreconcilable schism rendering the two impossible to acknowledge as the work of the same artist. In reality, the two actually point to a core, tradition-rooted sensibility that simply manifests itself here in two superficially different but fundamentally similar records. Scheinman’s “Miss Collins” and “Skinny Man” may be simple blues-rooted storytelling, but the cinematic nature of Crossing tracks like “Processional” and “Old Brooklyn” reveals Scheinman’s penchant for music as narrative. While both are excellent albums in their own right, Crossing the Field is the stronger of the two, if only because Scheinman’s ability as an arranger and performer is considerably more developed and authoritative than her ability as an interpreter. By making two polar opposite albums with such complementary strengths, Scheinman reaffirms the good that can sometimes come from musicians spreading their wings.